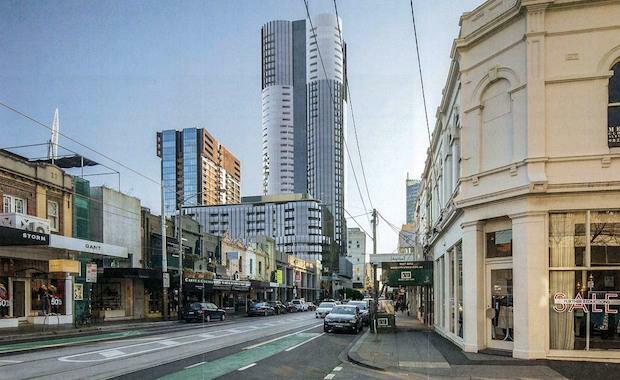 Will Proposed 190m Tower Stick At Slippery South Yarra? South Yarra has historically been something of a slippery site for developers: spanning as far back as 1989, many attempts have been made to realise a large-scale tower on South Yarra’s premier development site, but to no avail. In 2013, a 134 metre tower gained approval for 241-257 Toorak Road & 625 Chapel Street, under the control of Melbourne-based developer LK Property Group. Now, a new planning application has been submitted to increase the height and apartment yield for the project. The scheme, named The Capitol, is currently before City of Stonnington, seeking a 190-metre residential tower holding 660 apartments in a higher density format. Project architect Bates Smart has refined their previous design, creating a slimmer, taller tower while also reconfiguring the ground floor plane to allow greater circulation. The ground floor figure eight layout will heed 4,530 square metres of retail space, adding to the already heavy retail offerings nearby. While it may tower above all others in South Yarra, The Capitol wouldn't be completely out of place in what is a constantly evolving skyline. Given that the previous 41 storey development of 483 dwellings fell foul of City of Stonnington, it seems likely that VCAT or Ministerial intervention may well determine the fate of the current 190 metre proposal.